Aviation gas turbine refers to the turbine that works on Brayton cycle. The first generation gas turbine engine is turbojets. The working principle of the first type gas turbine engine is that, air is sucked from front and exhausted them at high speed from rear. Aviation gas turbine is widely used by commercial and military aircrafts. Global aviation gas turbine market is anticipated to flourish at a CAGR of 5.1% during the forecast period 2017-2024. Moreover, the global aviation gas turbine market is projected to post notable revenue by the end of 2024. Further, the market of aviation gas turbine is anticipated to grow on the back of growing aviation industry across the globe. 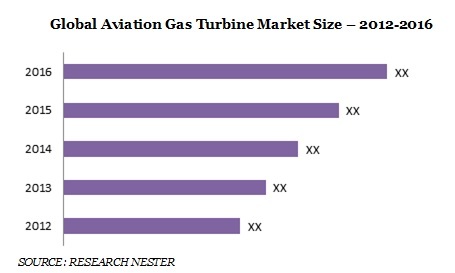 Similarly, mounting global air traffic and surging new deliveries of aircraft is opening the opportunities for the growth of the aviation gas turbine market. The global aviation gas turbine market is segmented into type, aircraft type and region. Further, aircraft type segment is further sub-segmented into commercial aircraft, defense aircraft, business aircraft and others out of which, commercial aircraft gas turbine segment is projected to capture the biggest market of aviation gas turbine. Further, the factors propelling the market of commercial aviation gas turbine includes rise in manufacturing of commercial aircraft along with growing commercial air traffic all across the globe. Geographically, North America captured the lion share in the overall aviation gas turbine market in 2016. Besides, North America is projected to continue its dominance over the forecast period. This can be attributed to the strengthening passenger air traffic in the region. Moreover, healthy outlook of the defense aviation industry in the region is expected to supplement the growth of the aviation gas turbine market. Europe aviation gas turbine market is the projected to grow at significant CAGR during the forecast period. Further, Western Europe countries such as Germany, U.K. and others are the prominent market of aviation gas turbine in this region. Moreover, growing concern regarding border security coupled with rising political crisis in European economics including Greece and Ireland are forcing governments to strengthen their air forces which in turn augment the demand for new aircraft. This factor is believed to flourish the growth of aviation gas turbine market. Additionally, Middle East & Africa market is anticipated to likely to contribute significantly to the growth of the aviation gas turbine market. The market of the aviation gas turbine is mainly expanding on the back of the growth and expansion of major airlines such as Qatar airways, Etihad and Emirates. 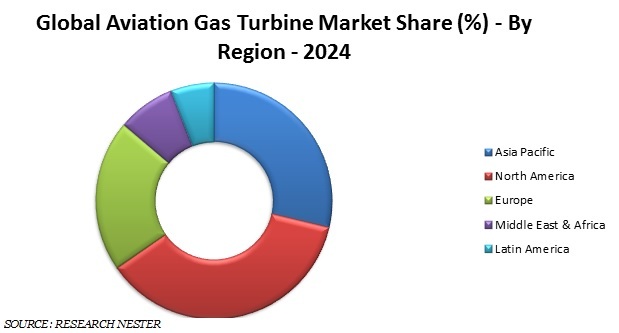 Factor such as surge in number of air travels all across the globe and technological advancement in the field of aviation gas turbine are some of the major factors driving the market of global aviation gas turbine market. Further, major companies are into research and development activities in order to cater highly advanced aviation gas turbine which is also projected to bolster the growth of aviation gas turbine market. Further, rising military expenditure all across the globe in order to advance their air forces is fuelling the growth of aviation industry which in turn projected to flourish the growth of aviation gas turbine market. Furthermore, swelled disposable income of the population along with rising spending power has flourished the growth of tourism. Likely, these factors are expected to substantially raise the demand for the aircraft which in turn paves a positive way for the growth of aviation gas turbine market by 2024. Moreover, 38,050 aircraft are projected to be delivered between 2015 and 2034 which further, is likely to positively impact the growth of the aviation gas turbine market. Furthermore, expansion of low cost aviation is anticipated to supplement the growth of aircraft industry which in turn will drive the growth of the aviation gas turbine market. Moreover, favorable government initiatives to increase the number of fighter aircrafts and to strengthen their air forces are likely to fuel the growth of global military aircraft market. Further, this factor is anticipated to supplement the growth of aviation gas turbine market. In contrast, decline in the defense budget spending in some nations is anticipated to negatively impact the growth of the global aviation gas turbine market.